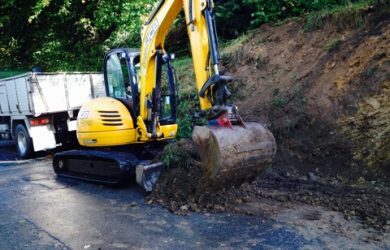 A1 Complete Builders won this contract under tender to reinstate Part of Giants Hedge, working alongside J.L.A Consulting Engineers from Liskeard. Once excavated nine bolt anchors will be drilled in place and grouted passing through a 450mm wide concrete block wall. The finish face will be stone using local stone sourced from Callywith, Cornwall. Duration of time on site for phase one: 6weeks. 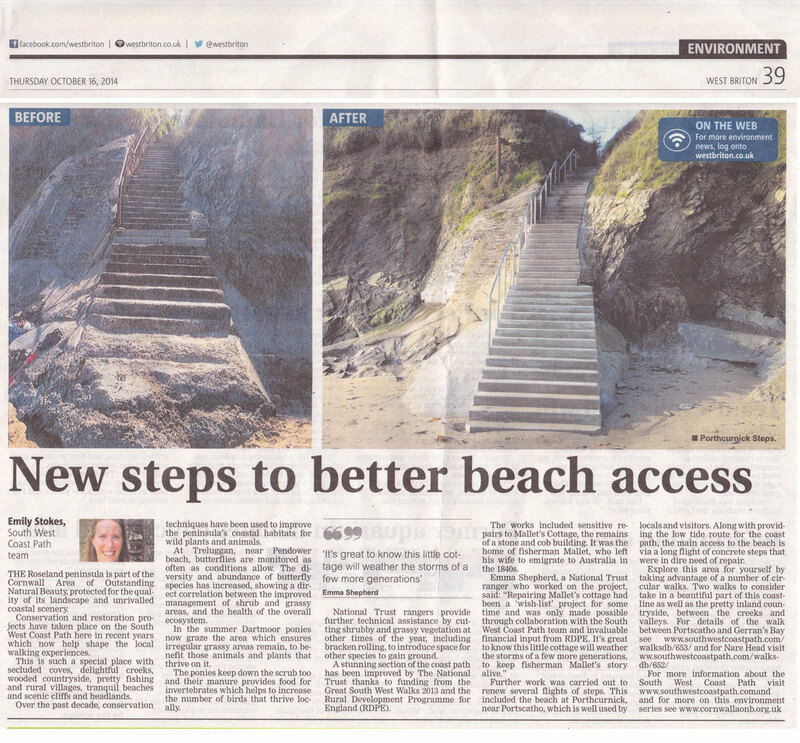 A1 Complete Builders was instructed by the National Trust to undertake the reconstruction and rebuilding of a flight of steps leading on to the beach, opposite The Famous Hidden Hut. The lower section of old concrete steps had taken a battering over the years and had broken up leaving no steps in place at the foot of the beach. 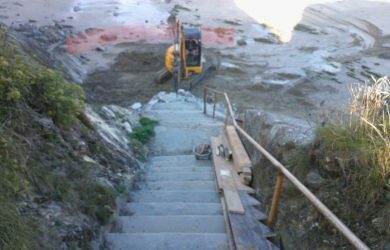 Excavating the sand down to bedrock and placing 4 cubic meters of concrete in place was the first task, once this was complete we then fixed shuttering to the sides and poured concrete in two hits to form 17 new steps. The next difficult task for my team was to place and lay 40 granite steps weighing in at around 400 kg each [too heavy to physically pick up] size 1.6 mts x 300 mm x 200 mm. Once in place a hand rail was fitted from the top to bottom finishing off this fine example of steps and opening late October to the public. 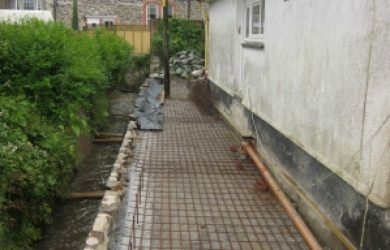 A1 Complete Builders works close with various architects and engineers and this is another project for J.L.A Consulting Engineers whom we have worked on various projects with Pont Quay, Fowey etc. This particular party wall collapsed in the winter storms December 2012 and A1 started July 2013 once given the go ahead by J.L.A. All collapsed soil and stone was removed and separated, stone cleaned off and stored ready to re-use plus 10%. The new construction was a standard 7 Newton blocks Built on the flat starting @ 1.5 meter wide part way up decreasing in size as it was constructed. Once constructed it was then rebuilt in stone. [Stone Faced] to match existing. Although tourism has taken over the town’s economy, Fowey remains a working harbour and still exports 1.2 million tonnes of china clay per year. In addition, at least 40% of all South West cargo passes through it. In the days when waterways were the main thoroughfares of life, Pont Quay was an important river quay serving a wide area of scattered farms and hamlets. 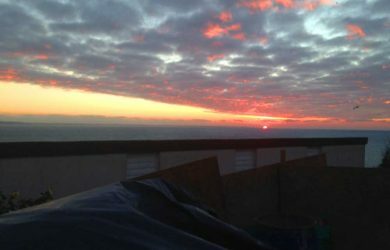 Sailing barges came up on a rising tide to unload coal, fertiliser, limestone, timber and roadstone and to load fresh produce from the farms of Lanteglos parish. 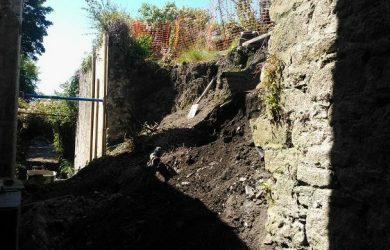 A1 Complete Builders recently undertook repairs to this Quay, Instructed by the National Trust and supervised by J.L.A Structural Engineers. A large type French drain was installed connecting to ten flap valves releasing the water from above or on spring tide when the water comes up and over. 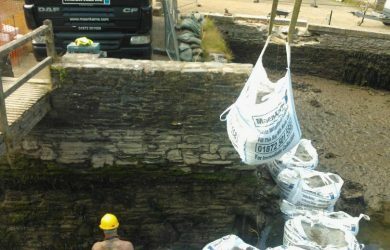 Also various parts of the Quay wall itself had failed and fallen away which had to be rebuilt in a local stone to match using Lime mortar. 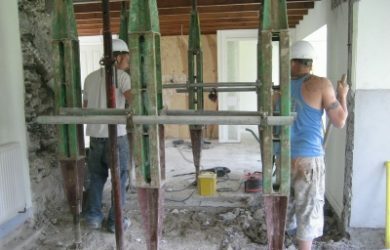 An Example of the removal of a Structural stone wall 1 Meter wide using Hydraulic props, creating a much larger Kitchen/Diner. Also various Internal work, New u.p.v.c French doors and windows complete with a new Cement Fibre Slate Roof.